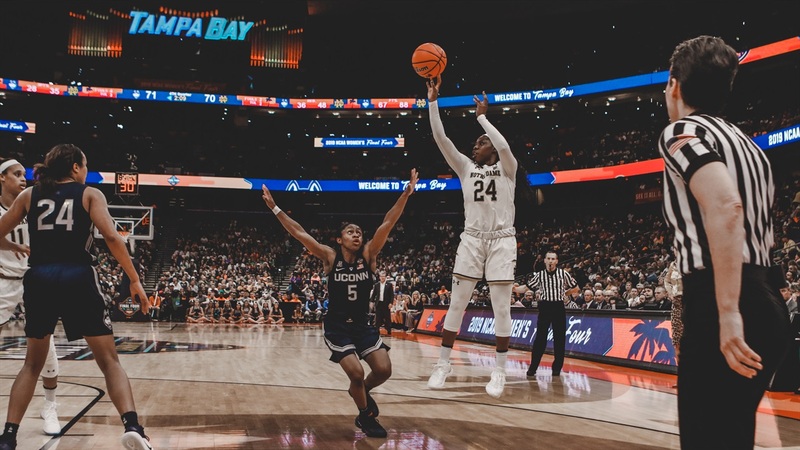 Notre Dame didn’t need last-second heroics from Arike Ogunbowale to beat UConn in the national semifinal game this year. However, the Irish did need heroic performances by the team to come back after falling behind by nine points two minutes into the fourth quarter. Ogunbowale, Marina Mabrey and Jackie Young combined to make 4 of 6 three-pointers to spark the comeback. Mabrey hit the final three with 4:29 left to knot the score at 66. The teams then traded baskets until the Irish seized the lead for good 74-73 with just 90 seconds left. After Ogunbowale made two free throws to give ND a three-point edge, Brianna Turner had a pivotal block and grabbed the rebound with just 49 seconds left. Two more Ogunbowale free throws stretched the Irish lead to five. ND made three more free throws after stopping UConn on two consecutive offensive possessions to lead 81-73 with just seven seconds remaining. 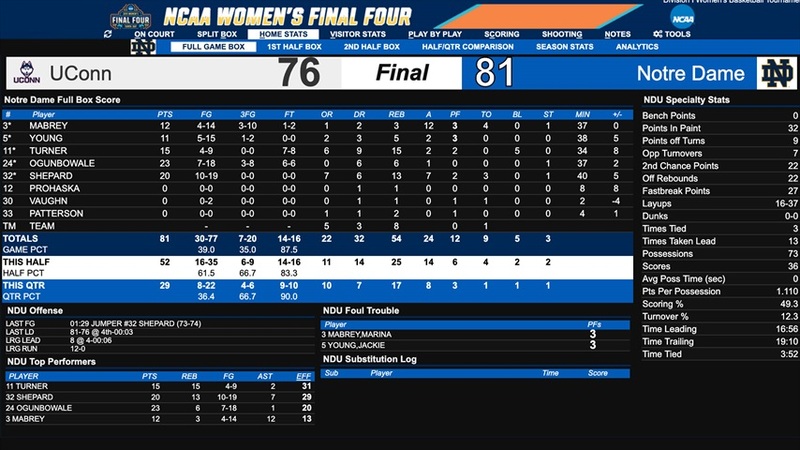 UConn hit a meaningless three in the final seconds for the final 81-76 score. “That was an amazing second half," Notre Dame head coach Muffet McGraw said. "First half I thought we really struggled to score. The second half, we really just caught fire. I think we played our normal game in the third quarter. Brianna Turner was absolutely outstanding on defense. She now has the blocked shot record at Notre Dame, beating Ruth Riley. So proud of her. She really single-handedly kept us in the game in the first half. She had so many key blocked shots. Arike in the second half did what Arike does. She had some huge screens, made some great plays, and then the free throws down the stretch. Also, Jessica Shepard, what an amazing game with 20 and 13." The Irish didn’t shoot any free throws in the first half but were 14-16 in the second half and 9-10 in the fourth quarter with the game in the balance. UConn was 6-9 from the line and just 4-5 in the second half. Ogunbowale scored 14 of her game-high 23 points in the final quarter. She only had two points in the first half after making only one of her seven shots. She was 6-11 in the second half, 3-5 from three, and 6-6 from the line. Turner and Jess Shepard dominated the Huskies on the boards — the Irish outrebounded UConn 19 to 6 in the fourth quarter and 54 to 37 for the game. ND had 22 offensive rebounds against 11 for the Huskies. Turner had 15 rebounds to lead the Irish. She scored 15 points and had 5 blocks. Turner made two free throws with 47 seconds left in the third quarter to hit two thousand points for her career. Her five blocks gave her the all-time Notre Dame record of 371, one better than Ruth Riley. Shepard played all 40 minutes. She scored 20 points, grabbed 13 rebounds, and had seven assists. Mabrey hit three three-pointers. She ended with 12 points and 12 of ND’s 24 assists. The 12 assists were a career-best for Mabrey — and an NCAA record for a semifinal game. ND’s four threes in the fourth quarter gave the Irish seven for the game (7-20). 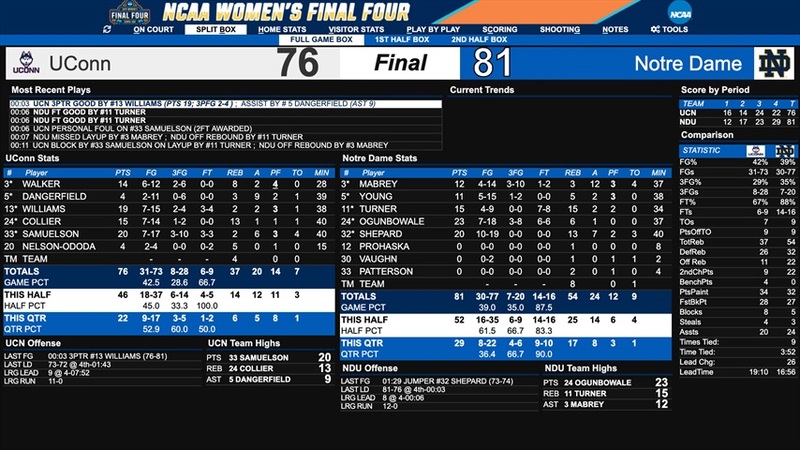 UConn was 7 for 27 from beyond the arc until the last second make by freshman Christyn Williams, who had another solid game against the Irish with 19 points. Young had a rough night shooting the ball — just 5 for 15 from the field for 11 total points. Similar to the last game against Stanford, the Irish got off to a slow start with just 12 first quarter points. The Irish were 6 of 20 from the field. Fortunately, UConn only made 7 of their 20 first quarter shot attempts. The Huskies led after one — 16-12. The second quarter wasn’t much better, but the Irish did score 17 to 14 for UConn to trail by just one — 30-29 at the break. UConn outscored the Irish 24-23 in the third quarter, as Katie Lou Samuelson scored nine points in the last two minutes of the quarter. She ended the game with 20 points to lead the Huskies. She made just 3 of her 10 three-point attempts and was 7 for 17 from the field overall. After scoring just 29 points in the first half, the Irish tallied 52 after the halftime break. Notre Dame has faced UConn eight times in the Final Four and have now won five. The Irish are 5-1 against the Huskies in the semifinal round. Notre Dame will attempt to win a second straight national championship Sunday evening against Baylor. The game will be the seventh national title game for the Irish. The Lady Bears beat Oregon in another close semi-final game 72 to 67 before the Irish and Huskies squared off. Tip-off for the championship is scheduled for 6 pm eastern. The game will be televised on ESPN. Like Irish Sports Daily on Facebook!